This post marks a couple of firsts for me. This is the first time I have made French onion soup in two years, but not because I don’t like it. I love it and I have missed it! No, I had to give this up along with many other foods while I was pregnant with our third son because I was so sick, and then after he was born I was still eating a very restricted diet because he had reflux and couldn’t tolerate many foods I like to eat. So this year I am thrilled to be able to enjoy all of my favorite foods again. And the other big, BIG first for me is the cookbook I adapted this recipe from. Until recently I have never owned a Julia Child cookbook, and I never watched her shows. For some reason I had the impression that her recipes were too complex, but early on in my cooking journey I could have really used her help because some of my creations were utterly horrifying fiascoes. A couple months ago my attitude changed when I was challenged to try a Julia Child recipe by one of my neighbors. Rose and her family moved into their house across the street last spring, and she was expecting her third child in October. I welcomed them to the neighborhood with a gift of homemade chewy oatmeal raisin cookies and we struck up a friendship. After we got to know each other a little better and she had a chance to be a taste tester for the Daring Baker challenges, she asked me if I would make a chocolate mousse for her sometime using a Julia Child recipe that another friend of hers had made for special occasions. She had the cookbook with the recipe and loaned it to me. I was slightly intimidated based on my prior thoughts about Julia Child’s cooking, but in the spirit of friendship I said I would try it sometime. I made it for a girls’ night out and realized what I had been missing all these years. I should have bought this cookbook a long time ago! So I acquired my own copy of Julia Child’s The Way to Cook and started reading. The book is not just a list of recipes to follow, but it’s like taking a master class in cooking. She focuses on technique and uses master recipes as the basis for each chapter, and I am learning more and more with each page. After the mousse, the next dish I made from the cookbook was French onion soup, and I followed her directions closely although I substituted homemade vegetable stock for the homemade beef stock. A day will come when I will take the time to make my own beef stock, but until then my homemade veggie stock will have to do. I just make a deeper, richer stock by adding dried portobello mushrooms and then cooking it down until the stock is a nice deep, golden color. I keep several quarts in the freezer and take them out as needed. I’ve made French onion soup many times before, but most of the versions I’ve tried or created added thyme or bay leaf or some other herbs, and the wine has varied between red and white. Julia’s version focuses on three flavors: onions, stock, and vermouth. She also adds cognac, and honestly I can’t imagine the soup without it anymore, it really makes that much of a difference. The soup is not complicated, but like any good soup it takes time, about 2-1/2 hours total. I use a mandoline to slice the onions paper thin. Julia didn’t specify a particular type of onion, though we prefer red onions for the soup, and I’ll occasionally toss in a leek if I have one that needs to be used. She also adds a little sugar which caramelizes during the cooking and helps brown the onions. She calls for preheating 2 cups of the vegetable stock, which I think helps maintain the temperature of the onions as they start to simmer. Since my stock is usually frozen, I put it all into another 6-quart pot and warm it up while the onions are cooking. This is winter comfort food at it’s best, and it’s easy on the budget, too. I like to freeze it in 32-ounce containers and just thaw one out and warm it up for an easy weeknight meal. This recipe now has my Make It Gluten-Free tips in the instructions. Melt the butter in the 6-quart pot and add the olive oil. Add the onions and cook covered over medium heat until the onions are tender and translucent, about 10 to 15 minutes. Stir in the kosher salt and sugar and raise the heat to medium high. Cook uncovered until the onions are browned, about 25 to 30 minutes. Add the flour and cook about 3 to 4 minutes. Remove from heat and add 2 cups of heated vegetable stock and whisk it in. Add the remaining stock, the Cognac, and the vermouth, and simmer partially covered over low heat for 1-1/2 hours. 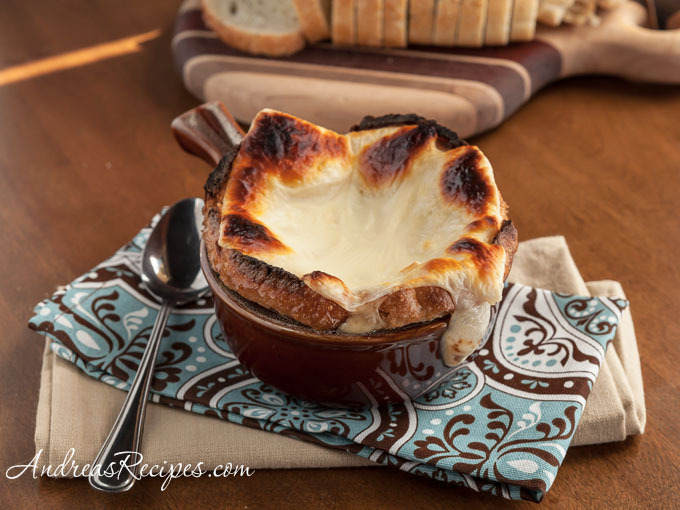 To serve: Preheat the broiler to 500° F. Pour the soup into the oven-proof bowl or crocks and lay a piece of the sliced baguette on top of each. Add a piece of sliced Swiss and sprinkle on some grated Parmesan. Put the crocks on the foil-lined baking sheet. Broil until the cheese it bubbly and golden brown. Serve hot with a big side salad or some roasted broccoli. Use potato flour or brown rice flour instead of all-purpose flour. Oh wow that looks good! I usually make mine with mushroom broth, instead of the beef broth for a vegetarian twist, but this looks heavenly! Dianne, I like your idea of a straight mushroom broth. That would give the soup lots of flavor! Ashley, I hope you get a chance to try it. We really love it! This looks amazing! I’ve been researching a vegetarian option for French onion soup (and I’m in school- so on a tight budget) and so far, modifying Julia’s looks like the best option. (Of course it does! It is Julia… :). Thank you for sharing. I’m going to make this ASAP!